GDNI About - Merrill Womach - Global Distribution Network Inc.
FROM THE INTRODUCTION TO THE WORLD'S FIRST MUSIC LIBRARY OF ITS KIND TO THE MEMORIAL VIDEO TRIBUTE PROGRAM. Global Distribution Network, Inc. was designed to provide professional-quality music and video to the funeral industry and hospice care providers. 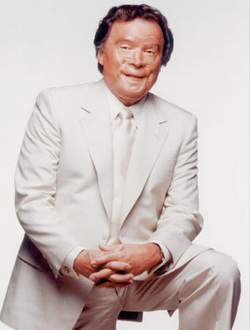 Global was fathered by the gospel music icon Merrill Womach. His company, National Music Service, started it all. We believed that through music, funeral service could fulfill a therapeutic mission to soothe, calm and relieve the pain of the grief-stricken heart. GDNI was started by Judie Sowards, the daughter of National Music’s President, Merrill Womach. Following in her father’s footsteps, Judie wants to provide the same caring funeral service that her father had done for more than 60 years. Merrill's vision was to honor a loved one through music and video. We continue to supply our customers a music library of classic gospel greats while adding more contemporary renditions. Our ever-growing video library launches in 2016. "His voice was pure and strong, a beautiful tenor that spanned four octaves. He was called the man with 42 voices." Merrill Womach believed that through music, funeral service could fulfill a therapeutic mission to soothe, calm and relieve the pain of the grief-stricken heart. He designed a proprietary recording technique to create musical recordings that fulfilled this need through the "Musical Presence" library-specifically designed for funeral service. GDNI is proud to offer a wide selection of Merrill's music for purchase online in our music catalog.